The Boone Central Cardinals had another tough weekend, beginning a very difficult stretch of games with losses to O’Neill and Wayne. However, Coaches Dan Zoucha, Todd Kramer and Roger Gentrup found some positives by their young team, as the Cardinals had chances to tie the O’Neill contest in the final moments Friday and put together a good start against a rated Blue Devil squad Saturday. Boone Central, 3-8, fought back from a sluggish start, took its first lead late in the second half and had two chances to tie in the final seconds of a 54-51 loss to visiting O’Neill Friday. 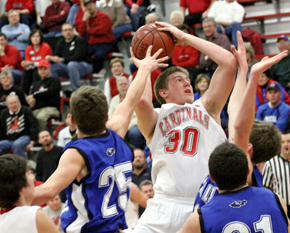 After falling behind 16-8 at the outset, the Cards fought back within five by halftime and continued to surge in the third period behind four points apiece by Brett Temme and Kade Leetch and a 3-pointer by Tyler Hedlund. Sophomore center Beau Bremer powered in six points in the fourth to culminate a strong performance, Leetch added four and Tanner Mazour nailed a key 3-point shot as the Cards stayed close to the end. Following an O’Neill turnover, BC had a chance to knot the score with two 3-point attempts in the final 12 seconds. Boone Central faced a tough task Saturday, traveling to Wayne to face the C1 Top 10 Blue Devils in a Mid-State Conference clash. The Cards got off to a strong start, taking a 15-10 first-period lead as Temme scored five points and Colton Mazour and Bremer netted three apiecce. Hampered by turnover woes, BC could not keep up the pace as Wayne exploded for 19, 24 and 23 points in the final three stanzas.